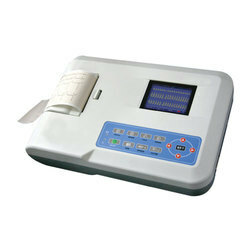 Providing you the best range of 12 channel ecg machine, 3 channel ecg machine, single channel ecg machine, ecg300 three channel ecg machine, ecg machine and digital three channel ecg with effective & timely delivery. Input way: Floating and defibrillation protection. ECG300 Three Channel ECG Machine. This Three-channel ECG from the house of Scure is made of plastic for good durability and comes in off-white colour. 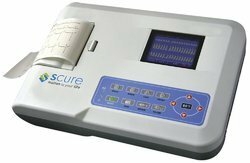 Digital Three Channel ECG device designed to continuously detect, measure, and display a patient's electrocardiogram (ECG) through leads and sensors attached to the patient, it also typically displays heart rate. 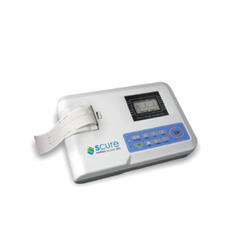 The device is typically equipped with audible and/or visual alarms that are triggered when the patient's parameters drop below or exceed pre-set limits.